Together this chair and ottoman set brings you traditional style as well as a comfortable place to sit back and rest your feet. Both pieces feature turned wood feet while the chair also has rolled arms and a tight seat back. The Bailey Traditional Chair and Ottoman Set by Elliston Place at Morris Home in the Dayton, Cincinnati, Columbus, Ohio, Northern Kentucky area. Product availability may vary. Contact us for the most current availability on this product. 2440 OTTO Ottoman 1 30" 25" 19"
2440 C Chair 1 38" 38" 35"
Leg or Skirt Turned wood legs. Traditional in style this accent collection can complete the look of your living room. Pair a chair and ottoman together to create a comfortable place to relax while also showing off your classic style. This collection features rolled arms and turned wood feet. 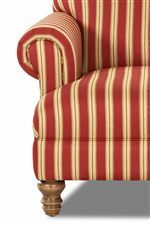 The Bailey collection is a great option if you are looking for Traditional furniture in the Dayton, Cincinnati, Columbus, Ohio, Northern Kentucky area.